No one likes to lose. When we find ourselves losing, we often try to connect with someone stronger to emerge victorious. When people start worshiping God, they hope that he will help them win their battles. And the world’s scriptures contain celebrated narratives of how the devoted overcame herculean odds by divine grace. Still, scriptures also contain alternative narratives wherein the devoted are defeated. How are such narratives to be understood? By expanding our conceptions beyond the material to the spiritual. Such narratives compel us to recognize how our own existence and God’s protection extend beyond the material level of reality. If we expect that God will ensure our constant success at this level, then our faith will be shaken, even shattered, by worldly reversals. More importantly, we will deprive ourselves of the many eternal blessings available at the spiritual level of reality. To understand how spiritual vision can change our perception of reversals, let’s look at the Ramayana story of the vulture Jatayu. He is best known for having attained martyrdom while trying to stop Ravana from abducting Sita. That lecherous demon had conspired to abduct Sita by sidetracking her protectors. As he was carrying Sita through the airways in his mystic chariot, Sita desperately called for help. Though Rama and Laksmana couldn’t hear, being too far away, someone else heard and acted. Sita saw the vulture Jatayu rising from a tree. This elderly bird had been a friend of Dasaratha, Sita’s late father-inlaw, and was residing in the Dandaka forest. When Rama, Sita and Laksmana had come to that forest, Jatayu had welcomed them with paternal affection. He had assured Rama that he would help protect Sita in the dangerous, demon-infested forest. True to his word, Jatayu was now flying to her rescue. Being the wife of a warrior, Sita quickly assessed the comparative strengths of Ravana and Jatayu. She realized that the aged bird would be no match for the younger and stronger demon. So, she called out to him, asking him to inform Rama about her abduction and cautioning him against intervening, lest Ravana kill him. But Jatayu found heeding Sita’s warning impossible. How could he live with himself if he did nothing to stop her abduction? Despite knowing that he would be hard-pressed to match Ravana, he felt driven to protect her by doing everything within his power. Determinedly, he flew by the side of Ravana, rebuking his irreligiosity in abducting a married woman. As expected, that discourse on virtue didn’t deter the vile demon. Jatayu promptly changed tack and challenged to a fight. When the demon kept flying on, Jatayu goaded him by calling him a coward who had kidnapped Sita behind Rama’s back. When he still didn’t respond, Jatayu resorted to the only option left for him: attack. He pierced Ravana’s arms with his talons, caught his hair in his beaks and pulled him around. Ravana roared in fury, feeling humiliated at being dragged thus by a mere vulture – that too in front of the woman he wanted to impress and have as his new chiefqueen. Initially, he had neglected the vulture, thinking him to be a powerless interferer. But when Jatayu attacked him so fiercely, he decided to fight and kill him. Ravana soon found that Jatayu, far from being an easy prey, was a seasoned fighter. Jatayu’s plan was to first immobilize the demon, then attack and kill him. If Ravana managed to fly off in his chariot, Jatayu would have no chance of saving Sita. Accordingly, he forcefully targeted and finished the mules moving Ravana’s chariot. With just one hit of his bill, he felled the charioteer. Then, with repeated blows, he shattered the chariot. Meanwhile, Ravana had been counter-attacking Jatayu with arrows discharged from his gigantic bow. But the bird had shrugged off the arrows and continued his attack. As his chariot fell to pieces, Ravana was forced to descend to the ground, holding Sita in one hand and his bow in the other. From the ground, the infuriated demon showered so any arrows on Jatayu that they covered him like a nest covering a bird. 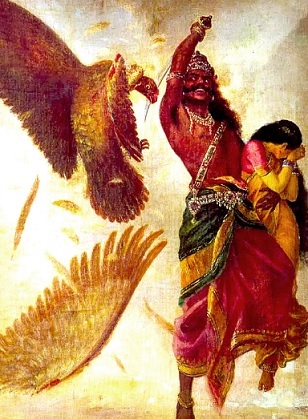 Though wounded, Jatayu kept attacking Ravana, eventually breaking his bowstring. But Ravana quickly strung another bow and counterattacked. Evading some arrows and enduring others, Jatayu swooped down on Ravana. With astonishing strength, he ripped off one of Ravana’s arms. But to his consternation, that arm grew back right away. Ravana had received a benediction from Brahma that whenever his limbs would be cut, they would grow back. Though Jatayu dismembered Ravana repeatedly, the cut limbs grew back within moments. Over time, Jatayu started tiring and his movements became slower. Soon, Ravana, while parrying the bird’s attack, sensed his opportunity. As the bird flew away from him, Ravana moved with lightning speed, using his sword to lop off one wing. In no time, he had lopped off the other wing too. Bleeding profusely, Jatayu fell to the ground. Crying in dismay, Sita, who had shrunk away from the gruesome fight, ran towards Jatayu to comfort him. With a victorious roar, Ravana dragged her by her hair. By his mystic power, he rose into the sky and flew away, leaving Jatayu, writhing in helpless agony. Though mortally wounded, Jatayu grittily maintained his life. Sita had asked him to inform Rama about her abduction. He had tried to do more, but had failed. Nonetheless, he was determined to fulfill Sita’s request. Despite being in severe pain, he waited, calling out the name of Rama and finding solace in that sacred chant. Meanwhile, Rama, along with Laksmana, was frantically searching for Sita. In due course of time, he came to a forest clearing that had evidently been the arena of a brutal battle. With upraised bow, he looked around grimly, dreading that Sita might have met her end here. Noticing a creature lying on the ground nearby, Rama thought that it was Sita’s demoniac abductor in bird form and prepared to shoot it with his bow. Jatayu was so badly mutilated that Rama couldn’t recognize him. What a test of faith it must have been for Jatayu when he saw Rama’s arrow pointed at him – the very same person for whom he had risked his life was about to take his life! Yet he faithfully continued chanting Rama’s name, his voice faint due to his diminishing strength. But Rama heard that faint chant. Intrigued, he lowered his bow and observed carefully. When he recognized the bird to be Jatayu, he ran forward and embraced him. With his last few breaths, Jatayu explained what had happened. Having performed his final service of informing Rama about Sita’s abduction, he fell silent forever. Grief-struck, Rama personally performed the last rites for Jatayu – an unprecedented act of divine grace that trumped social convention and guaranteed Jatayu life’s supreme success. Spiritual wisdom helps us understand that we are indestructible souls on a multi-life transmigratory journey towards eternal liberation: a life of spiritual love with God. We are all fighting a war against the illusions of worldly existence that allure us with temporary pleasures and deprive us of everlasting happiness. In this war, more important than succeeding in avoiding death – an avoidance that can’t anyway be continued forever – is succeeding in remembering God, the highest reality beyond the world of death. The Bhagavad-gita (8.5- 6) explains that our mentality at death determines our postmortem destiny. If our consciousness is fixed on God at the time of death, we attain his eternal abode. Therefore, remembering God at death is life’s crowning success. This success gives a reward far greater than the reward from many victories in life’s various battles, which will anyway be undone with the final defeat at death. Though Jatayu lost his battle with Ravana, he achieved the supremely rewarding success by dying in Rama’s presence, absorbed in his remembrance. And that he achieved such sterling success while being in a vulture body is all the more remarkable. In the Vedic tradition, vultures often symbolize ignorance, for they feast on corpses, which are considered extremely impure. But Jatayu, despite being in such a vulture-body, achieved the supreme fortune of dying in the presence of the Lord. In the bhakti tradition, the grandsire of the Kuru dynasty, Bhisma, is celebrated for having achieved the ideal death because Krishna was right next to him during his final moments. Long before Bhisma, Jatayu too achieved a similar ideal departure by leaving his mortal shell not just in the Lord’s presence, but also on his lap. And Jatayu’s fortune didn’t end there. After he departed, Rama, performing his last rites, offered him the same honor that a son offers his father. War strategists know that accepting defeat in a small battle to win a big battle is no loss. Spiritual vision helps us see defeat at the physical level to be like losing one battle in a war. But if that defeat impels us to increase our remembrance of God, then that increased remembrance is a significant spiritual gain. And if it inspires us to remember Krishna at the time of death, then losing the battle of survival in this life to win the war for attaining eternal life is a winning gambit. Of course, it’s unlikely that we will be asked to make such extreme sacrifices, but whatever challenges we need to face or losses we need to sustain in our service to the Lord, we can be assured that we will ultimately be the supreme gainers. 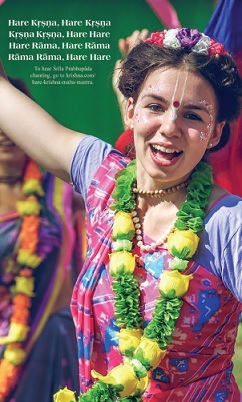 However, if victories at the physical level make us believe that we can be successful and happy in this world, and that we don’t need to raise our consciousness to the spiritual level, then worldly illusion has scored a major victory over us, for we are now proudly situated in her clutches. Though we may have won the battle in this world, we have sustained one more defeat in our multi-life war against illusion. In contrast, Jatayu lost the battle against Ravana, but he won the war against worldly illusion. He was victorious in defeat.